The Learning Disabilities Association of Peterborough decided to try its first ever online auction as a major fundraiser. The auction closes on Sunday June 5th at 5:00pm. It's easy to register and fun to bid. 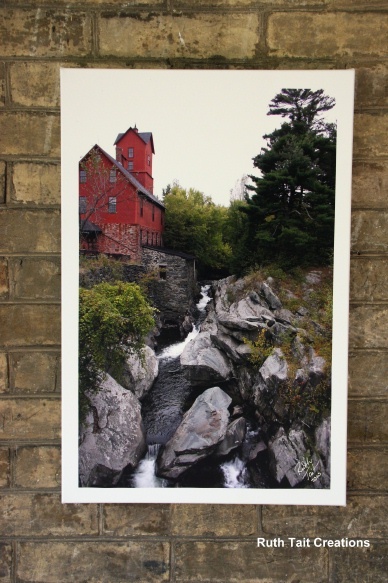 I have donated this 16"x24" canvas print called Old Mill - it's on page 7 of the auction. Remember bidding closes Sunday May 5th at 5:00pm! Wow!! 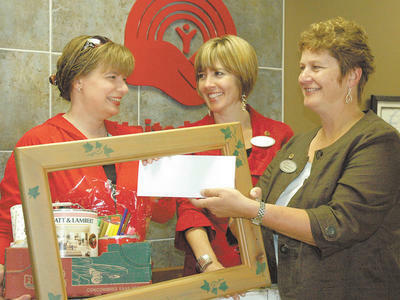 The United Way breakfast was held on Sept 15, 2010 and included the auction for 3 of the windows. Mitchell and Cameron were there to take in all the excitement (including getting autographs from the Muskies!). Muskie player, Zach Bayer took on the job of auctioneer - and this guy is soooo funny! He really got the crowd worked up and kept the bids going up. A great big "thank you" to him and his team mates! And the "Welcome" window created by the group went for $160 to Christina Golding, President of Community Living Kawartha Lakes. It was great to see the boys' faces as the bids kept going up and up! They were so surprised and impressed ... I was so proud of them!!! (LINDSAY) If the launch of the United Way for the City of Kawartha Lakes’ 2010 campaign was any indication, the organization shouldn’t be concerned about boosting this year’s goal by $10,000; even though it unsuccessfully hit last year’s $501,000 target. An impromptu stint by Muskie defenseman Zach Bayer filled the Lindsay Golf and Country Club with laughter, and the hands flying during an auction on Wednesday (Sept. 15) for the United Way’s annual campaign tee-off. Mr. Bayer was one of a dozen Muskie players who attended the breakfast, helped out at the Community Challenge golf event and lent a hand to the auction of Windows of Opportunity - a new addition to the campaign launch. 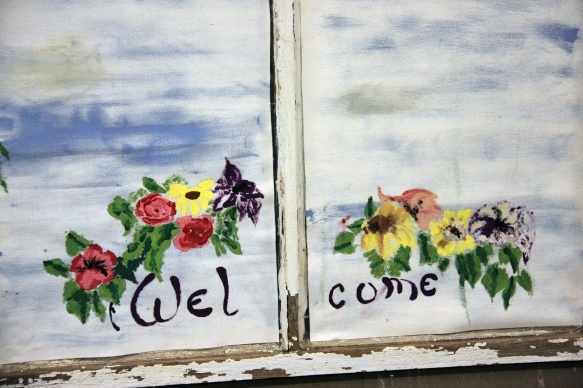 The windows were a joint project between the United Way and the Learning Disabilities Association with support from artist and photographer Ruth Tait and other volunteers. 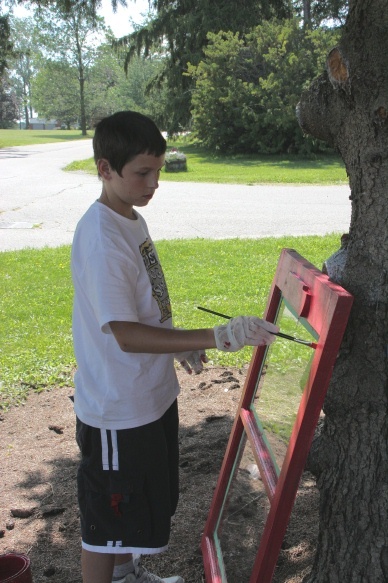 Local youth painted the donated window frames, which were displayed around the City of Kawartha Lakes. Three were brought to the event for auction which fetched more than $500 for the 2010 campaign. It was just one more way of helping make a difference in the community. Granted, said United Way executive director Penny Barton Dyke, “community investment and the way we did business, is much different from the way we did it 10 years ago.” She noted today there are many challenges and “unexpected curves” along the way. However, the focus remains the same; helping our neighbours, families and colleagues. When one considers that one in three residents of the City of Kawartha Lakes - or roughly 25,000 people - has been helped by United Way supported programs, it’s “all the more important” to give, said Barb Smith who is co-chairing this year’s campaign with Twila Del Fatti. “Meeting the goal will be challenging, especially with the current economy. . . but together we’re ensuring our citizens live with dignity,” said Ms Smith. Last year, close to $403,000 of the roughly $448,000 raised - the highest amount in the United Way’s history despite missing the goal - was distributed throughout the community, including allocations to 15 agencies and bursaries for one graduate from the Kawartha Lakes’ four high schools. Any workplace interested in operating a campaign, or anyone interested in operating a third party fundraiser for United Way, can call the office at 878-5081. 3 WINDOWS GOING TO AUCTION SEPT 15th!!!!! or $20/person to enter a team of four in the Community Challenge (golfing challenges such as Chipping and Closest to the Line) - this includes breakfast. You need to pre-register so please contact the United Way at 878-5081. Hope to see you there - ready to bid and support both the cause and the kids!!!!! Jake is 12 years old. He likes to play football, snowboard and enjoys drawing. His window is meant to be patriotic and fun with the cartoon characters. 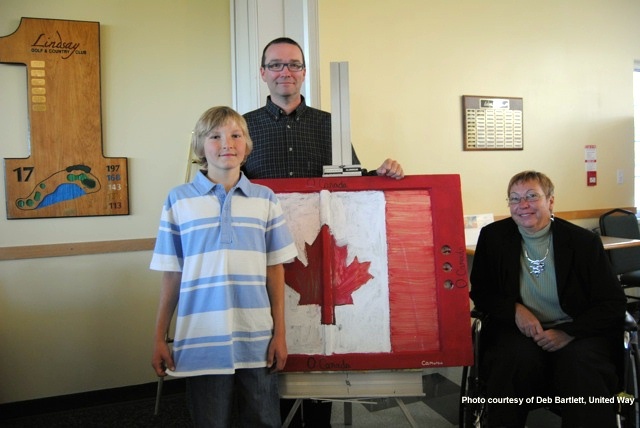 Jake's window is on display until mid-September at the Omemee Pharmacy and will be auctioned at a later date. Cameron is 11 years old. Cameron likes to play hockey, soccer, baseball and football. 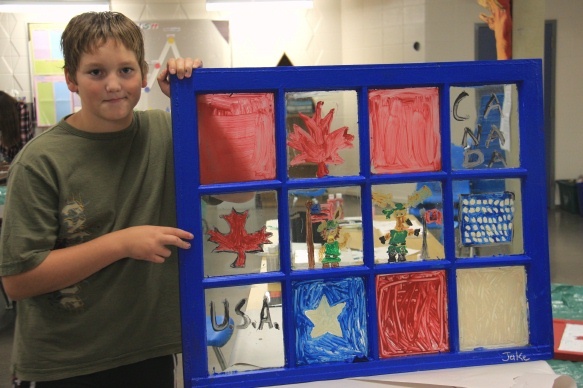 Cameron's window idea came from a design he saw on the computer of an American flag. He realized that he should do a Canadian flag. 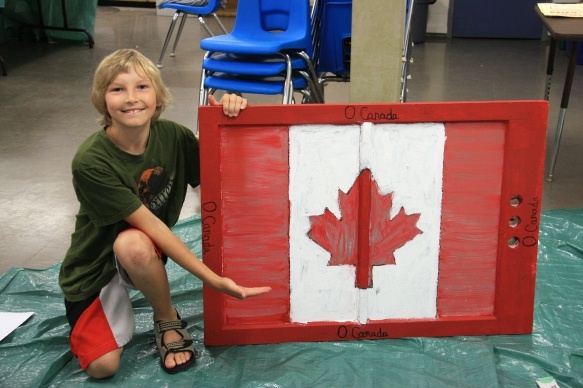 Cameron chose a window with 2 window frames so it would look just like a real Canadian flag. This window is on display at The Pita Pantry - downtown Lindsay - and WILL BE AUCTIONED at the United Way Tee Off breakfast Sept 15, 2010! Mitchell is 10 years old. 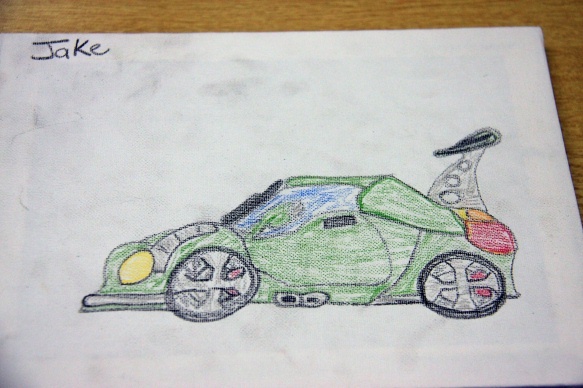 Some of his interests are cars, building and painting. 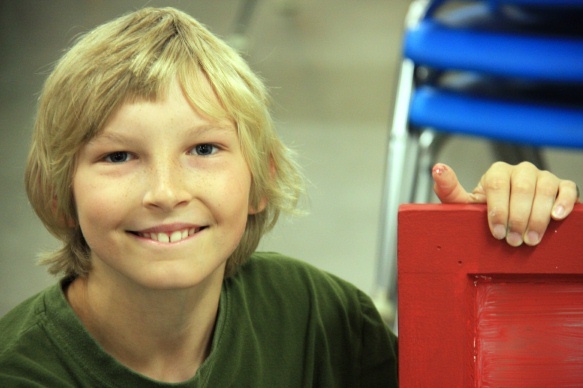 He lives in the City of Kawartha Lakes with his Mother, Dad and "annoying little sister". His inspiration for the window was Christmas. Winter is his favourite time of year. Mitch's window is on display until mid-Sept at Galaxy Picture Frames - downtown Lindsay - and WILL BE AUCTIONED at the United Way Tee Off on Sept 15th! Kira is 9 years old and has 2 brothers and 4 pets. In her spare time, Kira can be found swimming and drawing. 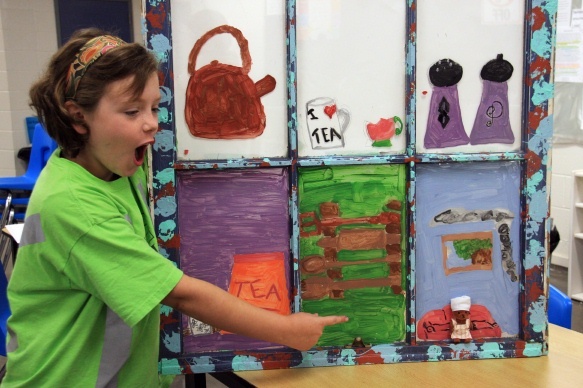 Kira loves cooking so she decided to paint about cooking and the utensils she uses for cooking. She likes funny things which is why she decided to have a chef bear sitting on the couch watching TV. She used a very creative splatter technique on the window frame. 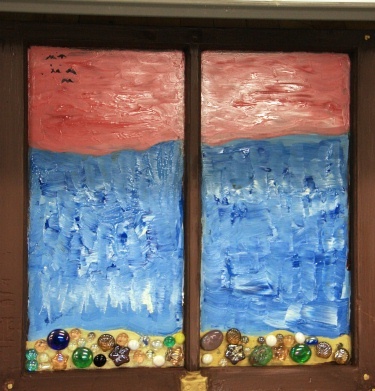 Kira's window is on display until mid-Sept at Tully Lark Coffee Shop in Omemee and will be auctioned at a later date. 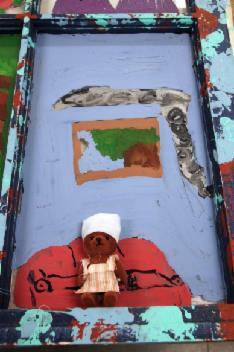 detail of the little chef bear sitting on painted couch - note the TV remote and the gray cloud of smoke coming from the kitchen!! Too funny!!! Hayden is 11 years old. He loves being outdoors and all kinds of sports. Hayden's inspiration is his mother. She loves roses and is a breast cancer patient. 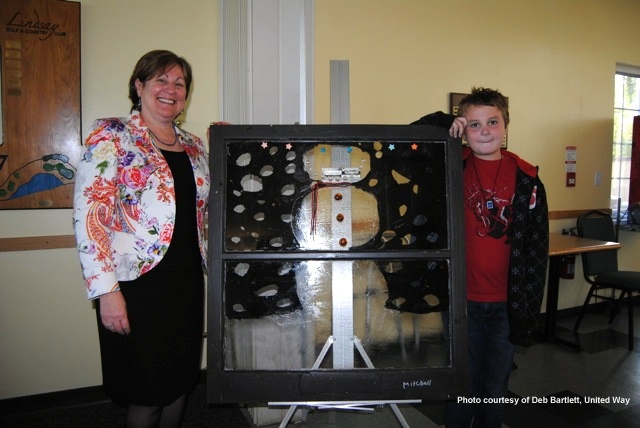 Hayden's window is on display until mid-Sept at Shopper's Emporium in Fenelon Falls and will be auctioned at a later event. 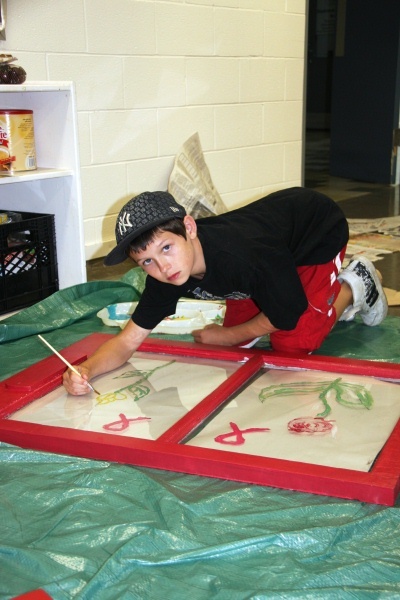 Lynda Rickard- a volunteer with lots of art experience - cleaned up one of the windows and helped to create a "group window" with several of the kids getting involved in the painting which has been done on canvas and mounted onto the glass. 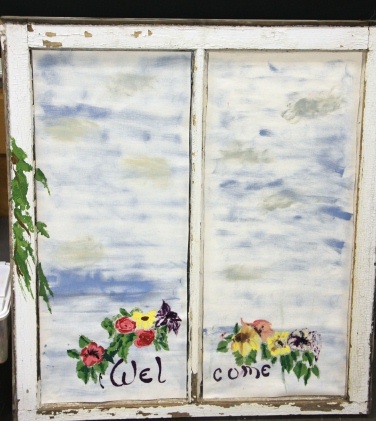 This "Welcome" window with the antique distressed frame would look great in your entrance hallway! 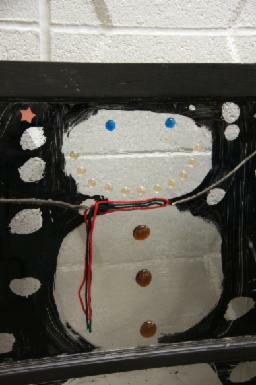 It is currently on display at Galaxy Picture Frames and WILL BE AUCTIONED at the United Way Tee Off on Sept 15th! 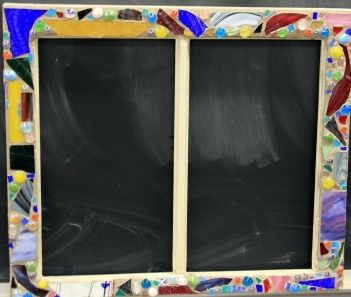 This mosaic by Darci will have a chalkboard ... so much prettier than a whiteboard or sticky notes! Maggie is a Trent University student pursuing her B.A. in English. "Windows of Opportunity" piqued her interest due to the idea of kids helping kids. As a former fine art student using art as a creative outlet is always something she has been enthusiastic about. 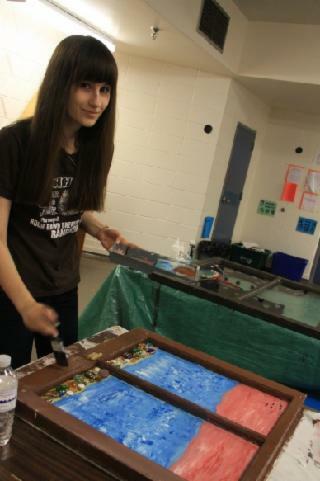 Her piece is an ocean theme using mixed media. 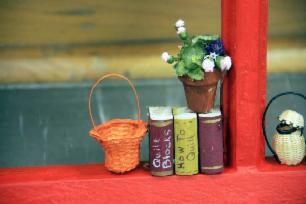 Maggie's window is on display until mid-Sept at Galaxy Picture Frames and will be auctioned at a later event. Maggie's beach scene will bring that warm, sunny feeling of the carefree days of summer into any room in your home! 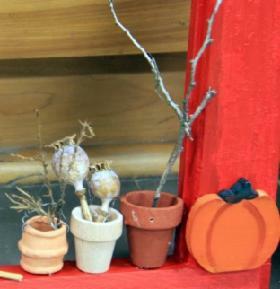 Peter's window frame is full of adorable little details that cover the 4 seasons. To the Adult Education Centre for the use of the classroom which was a perfect space for the project! And to Tim and Dan the caretakers for all your help - most appreciated. To all the people who went shopping or parted with some of their own art/craft/painting supplies or windows - thank you for your generousity. To all the businesses who have agreed to display the windows until the United Way tee-off. The second last session! Wow! This is zipping along really fast. A lot of progress happened and things are coming together quite nicely. Two of the boys are finished their windows, and it looks promising that by the end of next week everyone's will be completed. 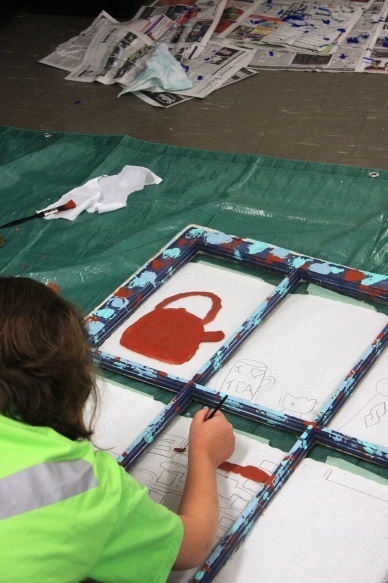 The kids have also been working on completing "artist bio's" that will accompany the windows, as well as working on a small canvas that they will be able to take home. Here's some more sneak peeks and next week I will finally reveal all of the finished windows together. 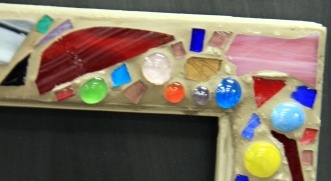 Stay tuned for details on where to view the actual windows and how to buy them!!! start making a space for this one in your kitchen!!! another finished window by one very proud artist!!! and he should be proud - wait 'til you see! Have I mentioned what great kids these are? Gotta admit, I'm an artist not a teacher and I didn't know what I might be getting myself into. We all hear the horror stories about "kids these days". Well, that may be ... but I lucked out!!! None of "those kids" are doing Windows of Opportunity! This bunch are so polite, and I can tell they really want to do a good job on the windows to impress everyone at the auctions so they get some big bids and help the charities! It's really nice to see them putting so much effort into it all. To start things off this week, the windows got a second coat of paint. 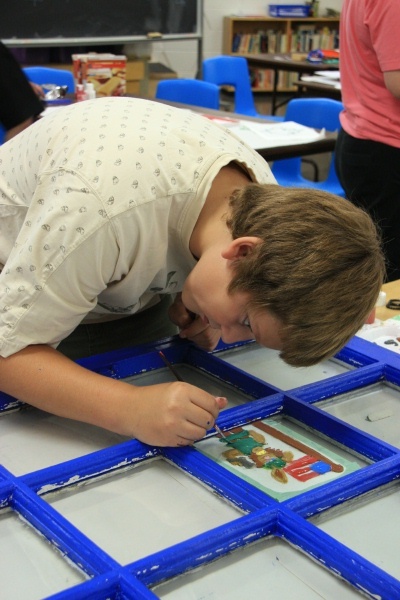 While waiting for the paint to dry the kids worked on the drawings that they wanted to paint on the glass. 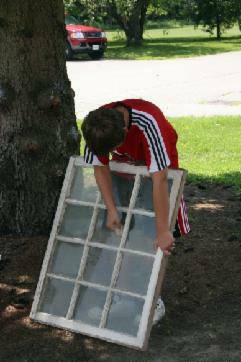 Window panes had been measured and paper templates were cut to size. 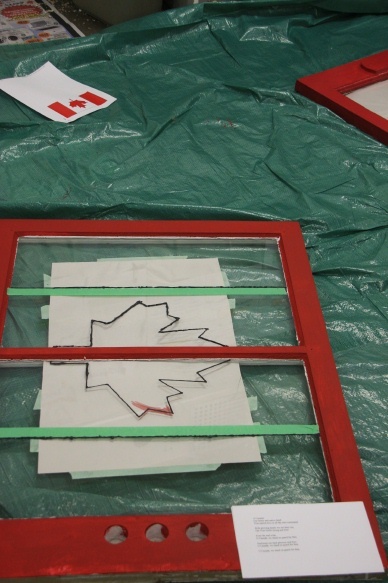 Once the paint was dry, off came the tape and any over-painting on the glass was scraped off. There was some serious concentration as the actual painting of the designs got underway. 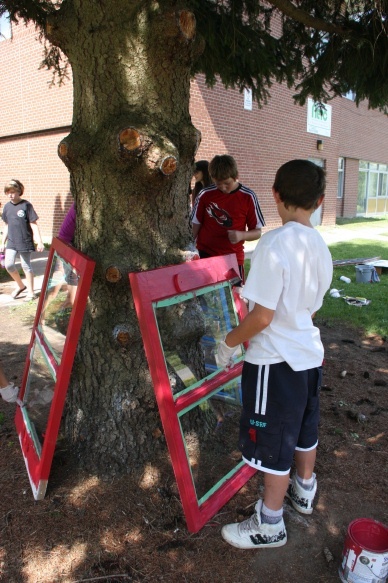 We had some extra windows donated and since part of the project is to have the decorated windows be auctioned as fundraisers for the United Way and the Learning Disabilities Association, the adults were all eager to complete a window too. 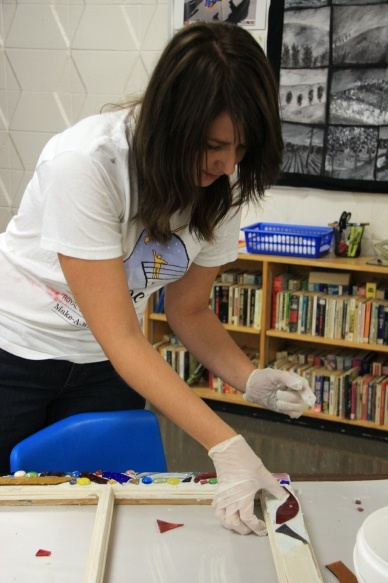 Pictured above is Darci, an intern with the Learning Disabilities Association, working on her design. don't worry, the hammer and glass never made contact!!!! Some glass cleaner, elbow grease and a hose took care of the dirt and cobwebs that were clinging to the windows. We are lucky to have some wonderful volunteers helping out with the project and Wednesday just happened to be Maggie's birthday - so while the windows were drying, we took a break for cake. Happy Birthday Maggie! So, I've decided not to reveal any of the actual designs just yet .... I'm hoping it's like a cliffhanger on your favourite TV show and you'll just HAVE to come back next week to find out what's happening with the windows. We started off small, with just four children able to attend the first session - but what a "Fab 4"!!! It was so much fun to work with them because they are all really into art and they're very talented. After some discussion about the purpose of the project, we did some brainstorming over where people might want to hang the windows. Didn't take much to get the creative juices flowing and the group had a lot of great ideas. In the image above the kids are hard at work designing their windows. By the end of the session everyone had finished a concept drawing of their project complete with some notes and details, chosen and measured a window, and started making selections of paint colours, beads, baubles, and other items from the donations. Speaking of which ... thank you to everyone!!! We have some great stuff for the children to work with! Wow! Very generous. Oh, and some of the stuff's kinda fun too - like the big box from Haliburton fabric artist Sandi Luck. Too much fun to resist ..... but hey, fashion design is art too ... right?! Beware of the pink warrior!!! Of course there's a Pink Princess!!! Next week, this group will get going on the cleaning, sanding and painting of their windows. Maybe I'll even reveal some of their designs - or maybe I'll keep you in suspense ... check back to find out!!!! 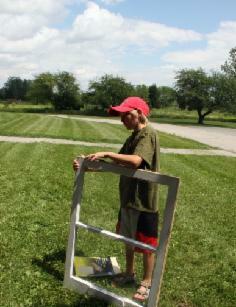 Window workshop opens opportunities for creative youth. 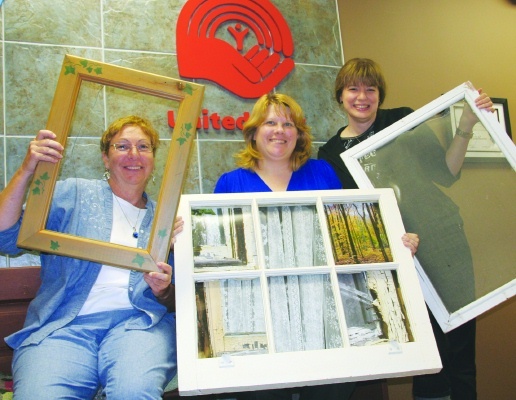 Artist Ruth Tait, left, is assisting the United Way for the City of Kawartha Lakes and Learning Disabilities Association's new project Windows of Opportunity. 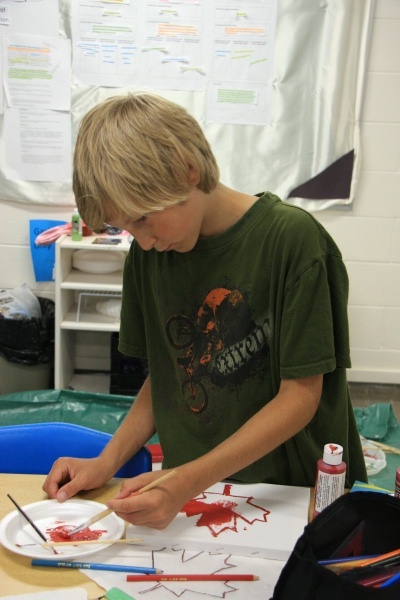 The workshop helps youth tap into their creative side in support of the United Way. Work will be displayed at the United Way's campaign kick off Sept. 14. The 2010 campaign, led by Twila Del Fatti (centre) and Barb Smith, hopes to raise $511,000 in support of agencies, including the association. (LINDSAY) Opportunity usually knocks on a door, but it can also open windows. Such is the case with a unique pilot project hosted by the local Learning Disabilities Association in partnership with the United Way for the City of Kawartha Lakes. 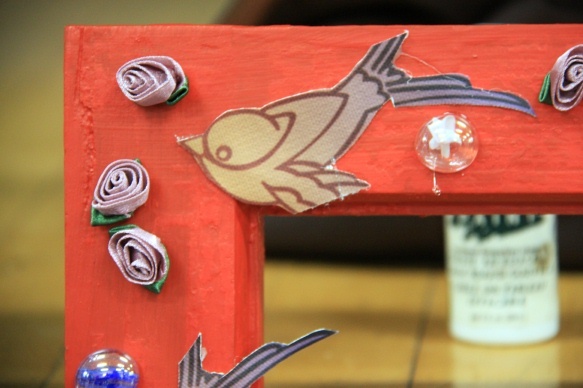 Windows of Opportunity is a creative workshop led by local artist Ruth Tait, bringing together imagination and recycling by having area youth turn old wooden windows into art. Current and past association clients are invited to sign up for the five-week workshop running consecutive Wednesdays, beginning July 14, at the Adult Education and Training Centre on Angeline Street South in Lindsay. 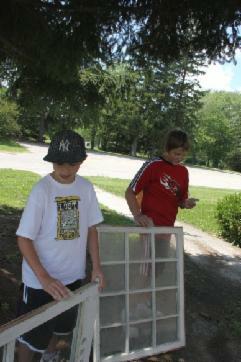 The seed was planted by United Way executive director Penny Barton Dyke who was recycling windows at her home last year. She mentioned it at the organization’s regular agency meeting and association resource facilitator Janice Balfour instantly saw potential for youth to discover their artistic talents, create an exciting and unique fundraiser, and build community partnerships. 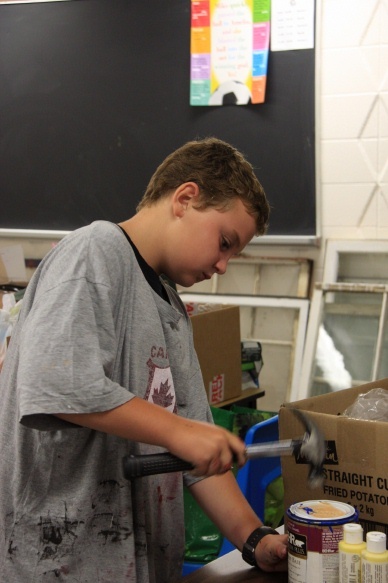 Ms Tait contacted local artists in June, asking for help with supplies, and the response was overwhelming. 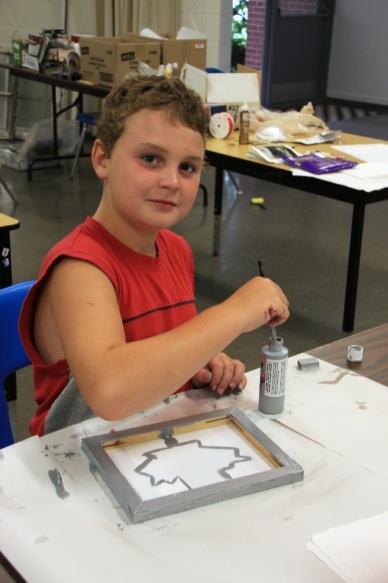 “Artists have been responding with promises of paint, fabric and lots of funky materials that might be used. The quick response has taken us by surprise,” continued Ms Tait. Some items are still needed including rubber gloves, sandpaper, face masks, paint brushes and wooden window frames. 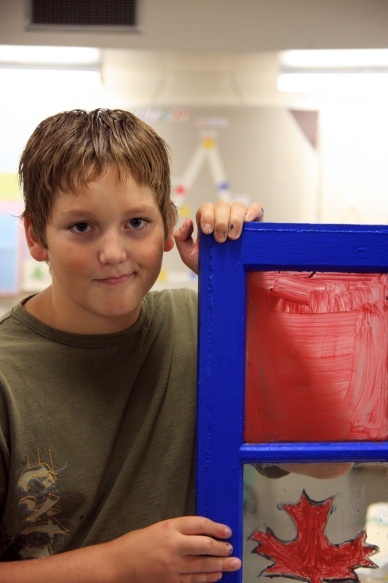 Ms Barton Dyke hopes individuals and businesses will sponsor a window project at $25 or with the supplies required for the student. The plan is to have the artwork displayed at banks and businesses throughout the City of Kawartha Lakes to help generate interest and bidders for two upcoming auctions - the United Way campaign launch on Sept. 15 at the Lindsay Golf and Country Club and Beat the Blues, being held next spring by the Learning Disabilities Association. The workshop is a “great win-win situation all the way around” according Ms Barton Dyke. 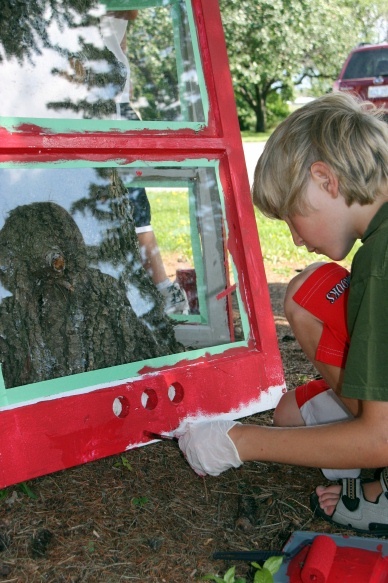 Organizers encourage children to express themselves, develop their artistic side and gain a sense of pride and, inviting private and business partners into a project to display or support each window, is an extension of celebrating and mentoring local youth. For more details, or to register, call the United Way for the City of Kawartha Lakes office at 878-5081 or Learning Disabilities Association-CKL at 324-2596. L to R: Penny Barton Dyke, Executive Director for the United Way for CKL, Janice Balfour of the Learning Disabilities Association and I pose for our picture in The Post. I am very excited about entering into a partnership with the United Way for City of Kawartha Lakes and The Learning Disabilities Association of CKL, as the lead artist on a new project called “Windows of Opportunity”. The following article from the July 2nd edition of The Lindsay Post tells the story well …. 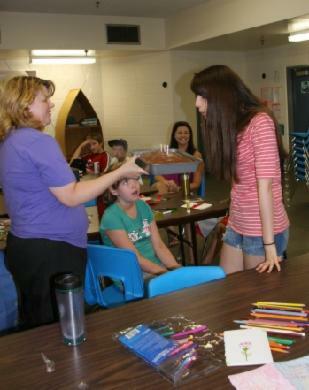 LINDSAY – Creative energy will be encouraged and celebrated in a workshop being hosted this summer by the Learning Disabilities Association, Kawartha Lakes Services (LDA-CKL). The project is called "Windows of Opportunity", a pilot project that will be led by local artist Ruth Tait. 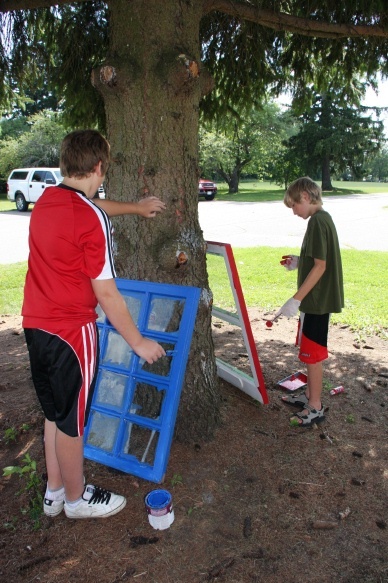 The idea of having youth turn old wooden windows into pieces of art was an idea officials with the United Way for the City of Kawartha Lakes and Janice Balfour, resource facilitator for LDA-CKL, have been looking forward to embarking on for nearly a year. "At meetings we would often give each other a look and say 'We need to do this project'," joked United Way executive director Penny Barton Dyke. Barton Dyke said she was renovating when she got the idea for the project. 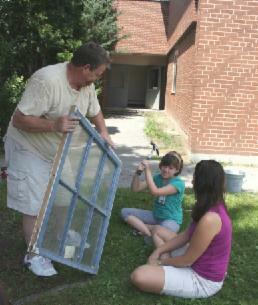 "I've always seen the value of what you can do with old windows," Barton Dyke told The Lindsay Post. "I thought to myself, 'we could call it "Windows of Opportunity'." Balfour and Barton Dyke agreed the project is a way to encourage youth to discover their artistic talents, create an exciting and unique fundraiser and to build community partnerships. Current or past clients of the LDA-CKL can sign up for the five-week workshop that will run consecutive Wednesdays, beginning on July 14 by contacting Balfour at 324-2596. 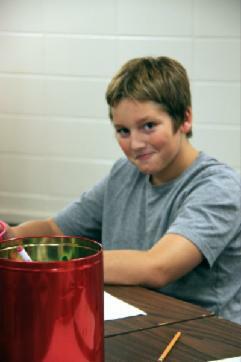 The students will be given the chance to decide how they want to approach their pieces of work. "They will be asked what their vision is," Balfour said. 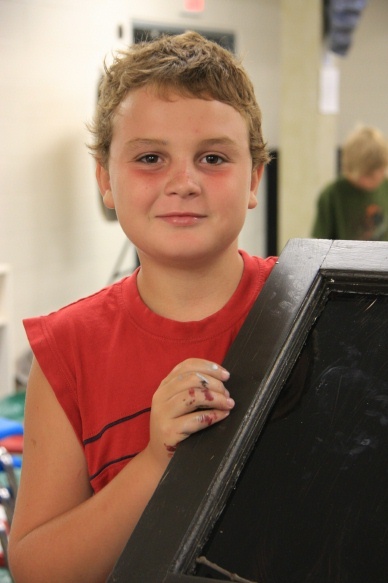 Tait climbed on board immediately as the artist who will help with the project. She said she believes it is a "very interesting concept". 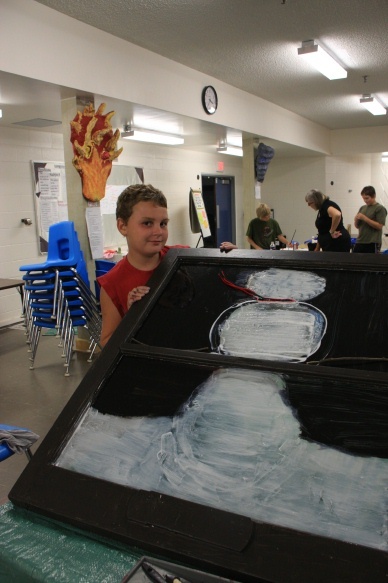 "They (kids) need to see the artistic side of learning is important as well," Tait said. Tait put out a simple request to local artists asking to help with supplies and the response has been overwhelming, she said. "Artists have been responding with promises of paint, fabric and other funky materials that might be used. The quick response has taken us by surprise," Tait said. Barton Dyke said they will be using the Adult Education Centre in Lindsay for the workshops and she believes it will be a great self-esteem builder for the kids taking part. ****She further said they are looking for donations of materials and for volunteers. 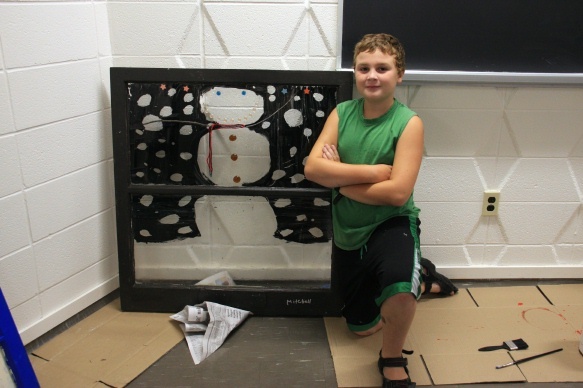 "We are hoping individuals and businesses will sponsor a window project at $25 or with the supplies required for the student," Barton Dyke said. 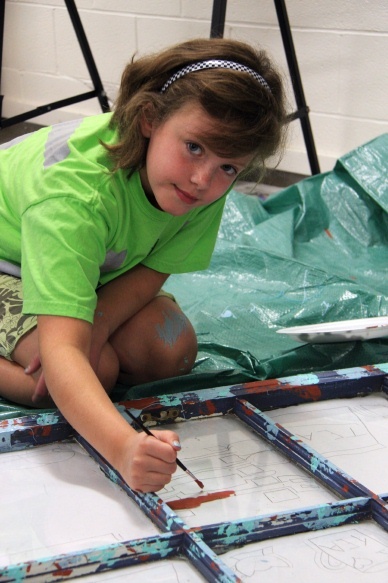 Barton Dyke further said they plan on auctioning off the children's art to help fundraise at the "Beat the Blues" event held by the LDA-CKL and for the United Way capital campaign launch that will take place in September. **** Please don’t hesitate to contact either of the 2 agencies or myself, if you if you are able to be of assistance. Art/craft/painting supplies or financial sponsorships may be dropped off at the United Way office on Mary St. W. Lindsay. Stay tuned to this page for regular updates on the project.